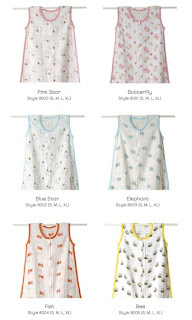 So, I just got my Aden + Anais order and the muslin sleeping bags look really great. They look soft and comfortable and cozy-just what I would want my DS to sleep in. The prints are really cute too!! I haven't had a chance to put them up on my website yet but they should be up really soon so go to http://www.daintybaby.com if you would like to order them. Also in are the Aden + Anais hooded towel set which includes a hooded towel and washcloth. The towel is really soft terry trimmed in white, pink or aqua. They are roomy and very absorbant!! The washcloths are made out of layered muslin in a print that matches the towel. I use the washcloths all the time even for my DD and she loves them. Whenever I rinse out her hair, she uses it to cover her eyes. Because they are made of muslin, they are soft against her skin and very flexible! I love these!! I especially love that the aden and anais sleep sack is thinner than regular sleep sacks because I live in Southern California and the others are just too hot most times of the year.